Hand-made, mouth-blown lead glass (over 24% lead oxide). 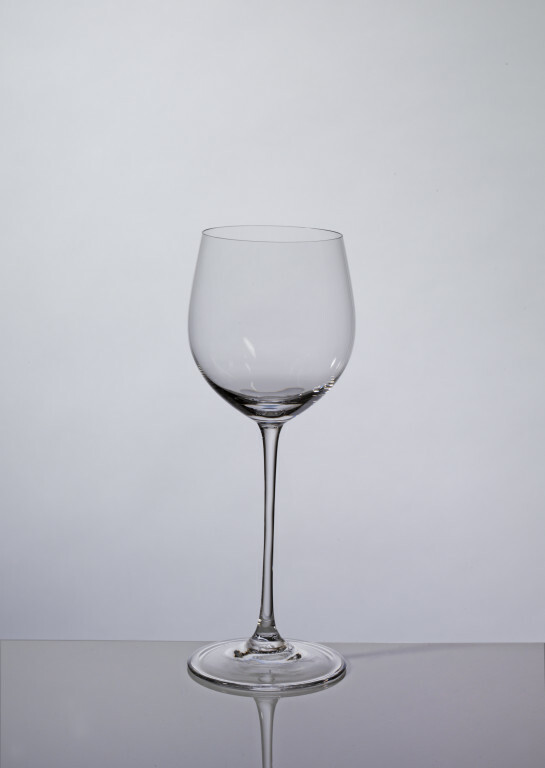 Gift of Riedel Crystal (UK) Ltd. The 'Sommeliers' range of finely-walled blown glassware began with the Burgundy goblet ('Pokal hoch' in German) awarded the grand prize at the 1958 World's Fair in Brussels. Claus Josef Riedel went on to create twenty-one further glasses for the range in 1971. Each shape was individually designed for a particular wine, spirit or liqueur and for the benefit of wine connoisseurs according to the principle of form following function. Thus capacity, size of evaporation surface, lip flare in relation to taste buds, and balance between bouquet and acidity were all taken into consideration. Clear colourless blown stemmed wine glass designed specifically for use with Alsace. The burgundy goblet ('Pokal hoch' in German) was the first glass designed for what became the Sommeliers range and was awarded the grand prize at the 1958 World's Fair in Brussels. A further twenty-one glass shapes were launched in 1971. Claus Josef Riedel (1925-2004) was a ninth-generation glassmaker and President and CEO of Riedel Crystal, Austria, from 1957 to 1994. The business traces its foundation to 1756, though has moved location and suffered periodic disruption over the years due to wars. Riedel spent many years testing out glass forms, sizes and thickness in relation to various wines to determine the best match for optimum enjoyment. His son Georg Josef continued to expand the Sommeliers range beyond the original twenty-two. Riedel's design principle is that form follows function. Each glass is designed to bring out the best from the particular drink that it is designated to be used for, with regard to capacity, size of evaporation surface, lip flare in relation to taste buds, balance between bouquet and acidity. The vessels are also very thin-walled.